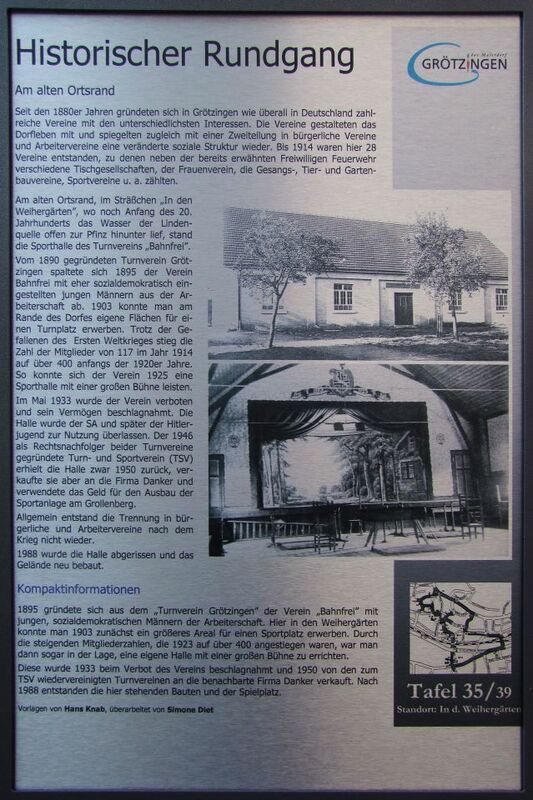 Since the 1880s, founded in Grötzingen as everywhere in Germany many associations with a variety of interests. The clubs designed with village life and reflected at the same time with a dichotomy in civil associations and workers' associations a changed social structure. By 1914, 28 teams were formed here, which in addition to the already mentioned volunteer firefighters different table societies, the women's association, the singing, animal and horticultural clubs, sports clubs were, among others. At the old outskirts, in the streets "In the pond gardens", where even the beginning of the 20th century began to water the lime source open to Pfinz down, was the sports hall of the gymnastics club "track free". From founded in 1890 Turnverein Grötzingen is 1895, the club web free split off with more social-democratic young men from the working class. In 1903 you could buy your own space for a gymnasium on the outskirts of the village. Despite the fallen of the First World War, the number of members from 117 in 1914, rose to over 400 the early 1920s. So the club in 1925 could afford a sports hall with a big stage. In May 1933, the club was banned and confiscated his property. The hall was left to the SA and later the Hitler Youth to use. The gymnastics and sports club, founded in 1946 as the legal successor of both athletic clubs (TSV) received the hall while back in 1950, but sold them to the company Danker and used the money for the expansion of the sports facilities at the mountain resentment. Generally not created separation in civil and workers' associations after the war. In 1988 the hall was demolished and redeveloped the site.